Capital resources are goods produced and used to make other goods and services. 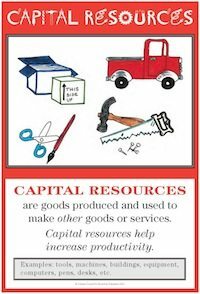 Basic categories of capital resources include tools, equipment, buildings, and machinery. However, any good used by a business to produce other goods and services is classified as a capital resource, including mundane items such as shipping boxes, invoice forms, pens, or file cabinets. Goods can often be classified as either consumer goods or capital goods. For example, when a person buys a truck for personal use, the truck is a consumer good. When a business buys a truck to transport products, the truck is considered a capital good. The key to economic growth and rising standards of living is increasing productivity. Probably the most important way for a country to increase productivity is through the acquisition and technological improvement of capital resources. However, in order to invest in additional capital resources, countries (including businesses and individuals) must forgo current consumption of consumer goods and services. Investment in capital resources may mean less current consumption, but it means more goods and services in the future. Economists have also coined another useful term - human capital. Human capital refers to the quality of human resources, which can be improved through investments in education, training, and health. Just like regular capital resources, investments in human capital increase worker productivity. Draw pictures of capital resources used to produce specific goods or services. Make a bulletin board of the drawings entitled, "People Use Capital Resources To Produce Goods and Services." Bring examples of capital resources to the classroom. Discuss how they are used in production. Make a timeline, with drawings, showing how capital resources have changed over time. For example, illustrate the development of agricultural tools and machinery. Make goods out of modeling clay, using pencils, rulers, paper clips, etc. as the "capital resources." Invite a labor or business representative to share which capital resources they use and how this has changed. Give examples of how people improve their human capital (e.g. an athlete trains diligently, people go to college or technical school to acquire skills). Create and draw a factory production process. List all the capital resources shown in the drawing. Debate this topic: "Which is more important, investing in capital resources such as tools or machinery, or investing in human capital, such as education and training?"